As you have probably noticed from my numerous Instagram posts, is that I’ve been eating copious amounts of cherries over a 21 day period in support of the Seasonal Cherries 21 Day Cherry Challenge. The campaign is based around the notion that it takes 21 days to form a new habit. The 3 key areas of the campaign supported maintaining a balanced diet, aiding sports recovery, and fine tuning your sleep-wake cycle so you wake up feeling uber refreshed. I’m almost at the end of my campaign but if you’d like to hear more about it please click here. 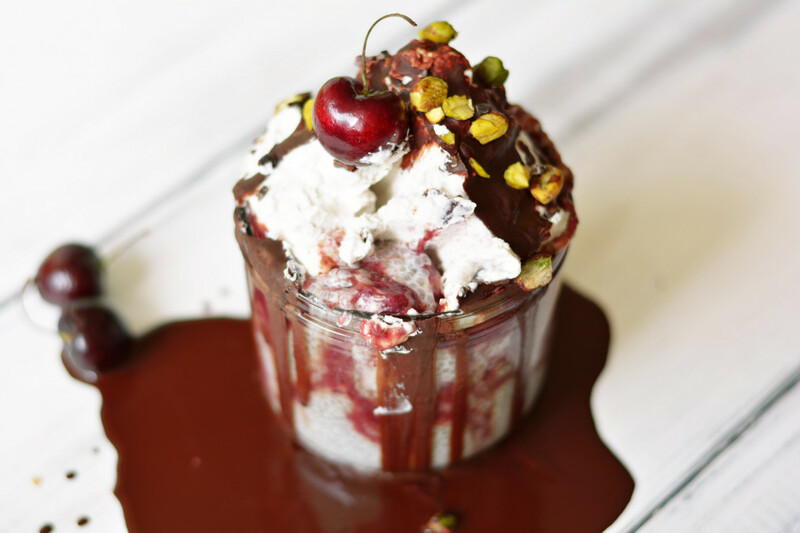 This yummy Cherry Chia Breakfast Parfait is certainly special with layer upon layer of deliciousness – almond chia pudding, cherry chia jam, almond coconut whipped cream, and a raw chocolate magic shell. It might sound a little complicated to make but it’s actually ridiculously easy! Now, eating cherries for 21 days isn’t as easy as it sounds, if like me you bore easily then just eating something in one particular way becomes, well, a little tedious – so naturally I found some creative ways to eat them. 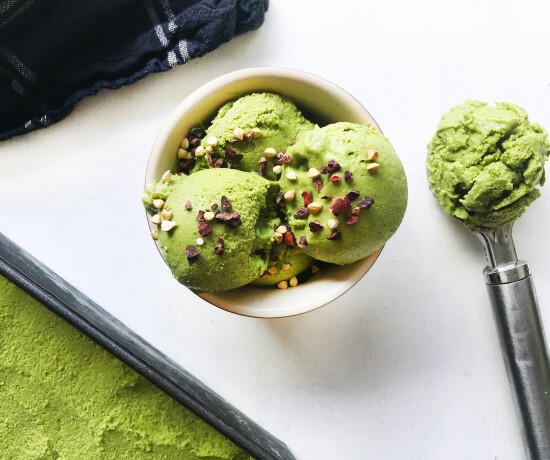 From Healthy Maraschino Cherries to Black Forest Smoothie Bowls, it’s safe to say that there has been nothing boring about this challenge. And as breakfast is the most important meal of the day it makes a whole lot of sense to eat something super special – right? 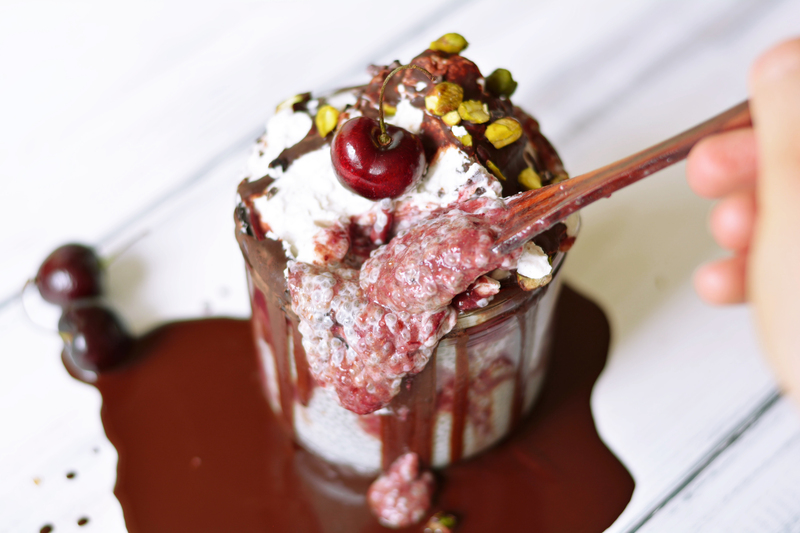 This yummy Cherry Chia Breakfast Parfait is certainly special with layer upon layer of deliciousness – almond chia pudding, cherry chia jam, almond coconut whipped cream, and a raw chocolate magic shell. It might sound a little complicated to make but it’s actually ridiculously easy! This breakfast parfait is literally something that dreams are made of – you just make your chia pudding the night before, blitz up the chia jam in a blender and then layer it all together. 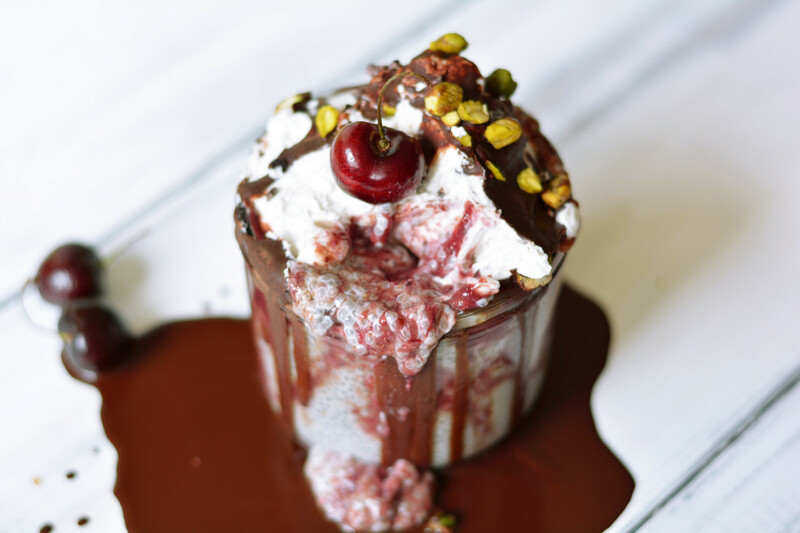 The almond and cherry flavours marry together perfectly and the whipped coconut cream adds a beautiful airy texture that makes this feel more like a dessert than a nutrient dense breakfast. Chia seeds love water, so much so that they are able to hold up to 12 times their weight in water! This is the perfect way to not only hydrate yourself but keep you feeling fuller for longer, thus being a great aid to weight loss and an amazing breakfast food. Chia seeds were also used by the ancient Aztecs as a running fuel because they helped to keep them hydrated for long periods of time. It also fueled them to run harder, faster, and longer. Chia seeds are high in omega-3 fatty acids, dietary fibre, high quality protein, and antioxidants. Chia seeds can help to lower LDL cholesterol (the bad stuff) and raise your HDL cholesterol (the good stuff). Chia seeds are known to improve symptoms of Type 2 Diabetes and reduce inflammation within the body. Love cherries? Why not try out the recipe for my Raw Maraschino Cherry Cheesecake Brownies? 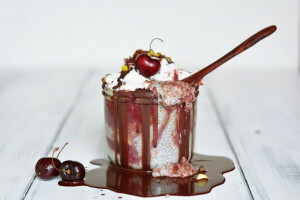 Make breakfast super special with this Cherry Chia Breakfast Parfait - almond chia pudding, cherry 'jam', coconut whipped cream, and a raw chocolate shell. The hard layer of cream from 1 tin of coconut milk that has been chilled overnight. Stir all of the ingredients together for your chia pudding and leave to set in the fridge overnight. Next Blend all of the ingredients for your cherry jam in a blender until smooth. 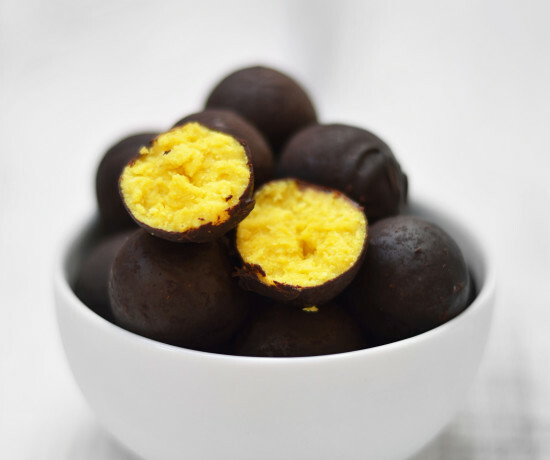 Place in an airtight container and leave in the fridge overnight. 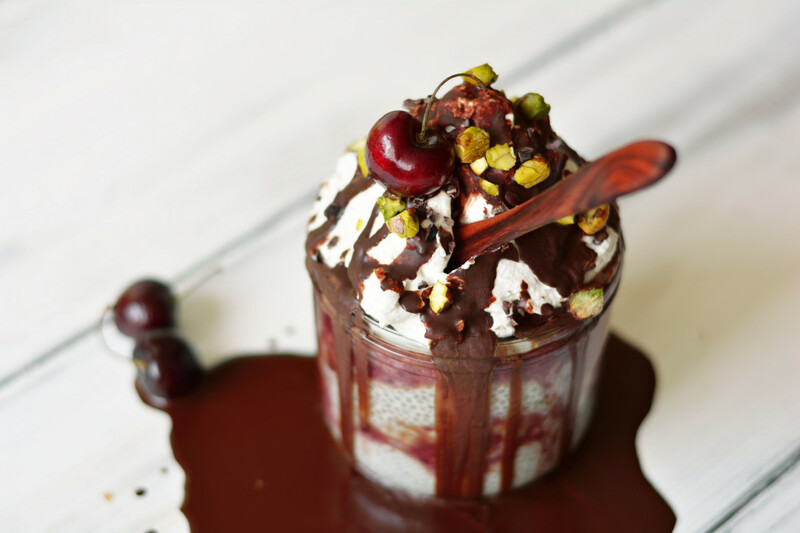 In the morning layer up your chia pudding and jam in 2-4 glasses or mason jars. Place to one side. Begin to whip together the ingredients for your coconut whipped cream. Pile your cream on top of the glasses. Next stir together your ingredients for your chocolate sauce and drizzle over. Sprinkle over your toppings and enjoy! *Preparation Time is 15 minutes plus an overnight setting time. **Please note that all cup measurements used are British cups and thus equal to 250ml. That challenge sounds awesome! Plus, I love that it inspired this. Obsessed with that magic shell drip… omg! Oh wow, this is amazing! You and your desserts. I’m always drooling over here! I need a bucket of that chocolate sauce. Yay! After you teased the pic of this last week I was crossing my fingers you’d post the recipe!! Sooooo gorgeous! Your desserts are UH-MAY-ZING! YUM!!! Could breakfast look any more decadent!?! I would definitely be up for a 21 day challenge, I never get tired of cherries! Wow ! This is totally amazing ! perfect for hot summer days ! This look like such a great breakfast! That cherry jam sounds great on it’s own as well! Swoon! Oh my goodness this is bliss in every bite. I would LOVE to enjoy this for breakfast! 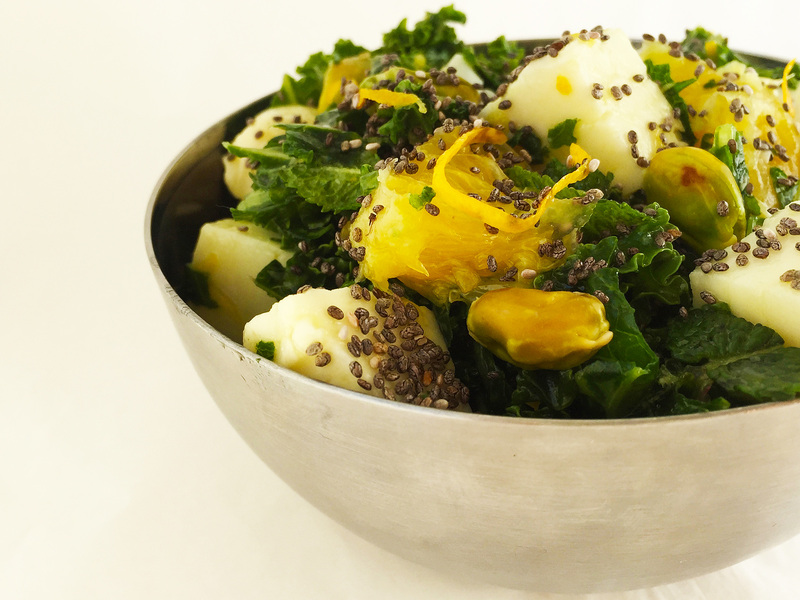 Oh, I love a nice and easy no-cook breakfast recipe for summer! What a superb dessert idea, looks tasty too! 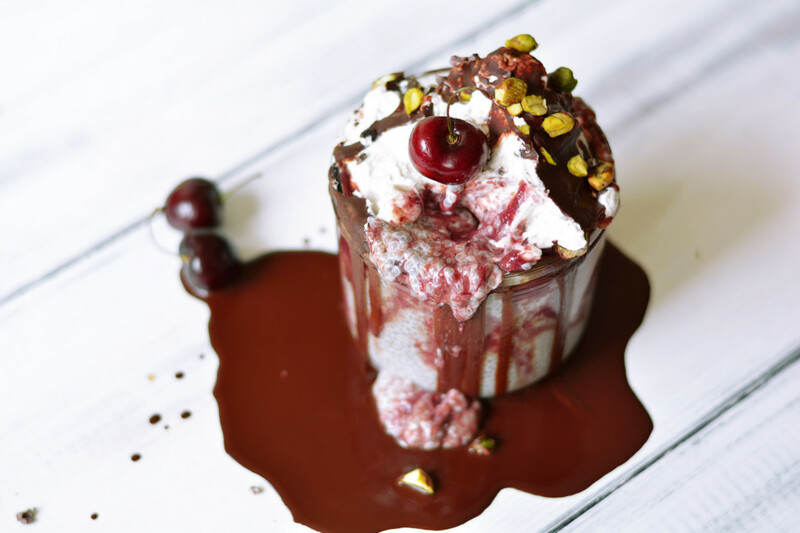 I have become so addicted to cherries lately – I’ve been buying big frozen bags of them and tumbling them into smoothies or ice cream. This looks fabulous, I totally love the photo, too. Wow, what a fabulous idea for breakfast!